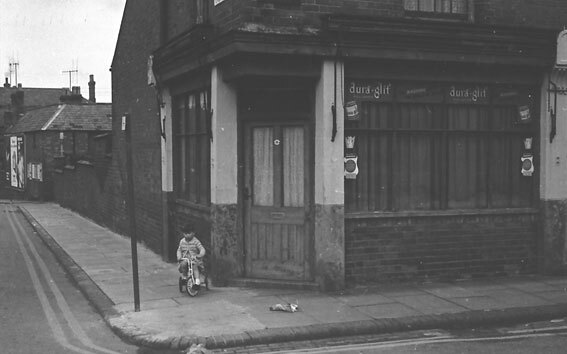 In the 1950s and before the war Number 48 was “Swains” a sports equipment shop. As a gameing shop now it is more-or-less in the same tradition. The right hand window usually displayed footballs, tennis rackets and cricket bats; the left hand window had luggage on display. Footballs in those times were made of leather panels and had an inflatable rubber bladder. When the bladder had been pumped up the nozzle was secured with string or elastic bands and then tucked into the leather casing. The opening was then laced up tight. On wet days the ball soaked up a lot of water and were hard to kick and impossible to head. Football boots were made of hard leather with leather studs nailed into the sole. As the boots wore down the nails would often come through the sole and cause discomfort to the foot. Swains also sold indoor games such as chess sets and cribbage boards. The owner of the shop was a Mr Willcox. The frontage appears to be original although I am not sure about the doors. From memory, the entrance was a single door set into the porch. Swain’s business claimed to have started in 1898, but not, I think, at this address. The bookshop next door at Number 50 used to be the Wolverton Mutual Society Coal Merchants. Number 54 was variously Sykes the tailor and Greys, Gentleman’s Outfitters. Number 56 was a Ladies Milliner’s shop run by a Mrs Wilson. The Estate Agent shown here used to be Lawson and Son in the 1950s. The shop sold tableware, toys and stationery. Stuart Lawson, the father was the principal; his son Barry was probably in his early 20s in the mid-50s. Stuart Lawson was a keen amateur photographer and an active member of the Wolverton Photographic Society. The Co-op built Wolverton’s only department store here in the 1930s. they must have taken down three houses in order to do so. Within this store sold furniture and drapery, and they may have had other departments. I don’t think I ever had occasion to go inside. Maisies, the present occupants, used to occupy 54-6 Church Street. I don’t know when they took over the Co-op store. This block has been completely rebuilt. or refaced. judging by the type of brick used, this must have occurred at the time that the Agora was constructed. 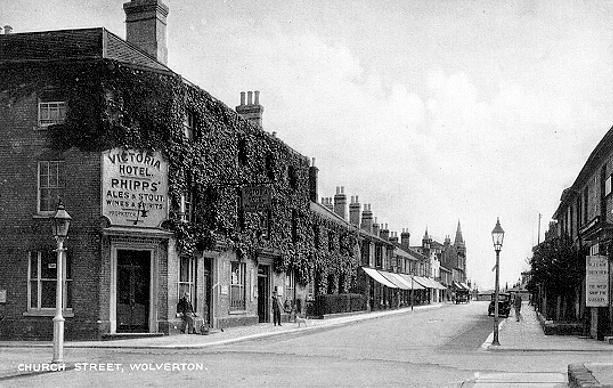 The corner building was for a long time the office of the Wolverton Building Society. Transactions were relatively uncomplicated in those days. You saved money with the society, usually weekly. When you had sufficient money for a deposit you could apply for a mortgage. Most of Wolverton’s citizenry were owner-occupiers in those days and the Building Society was therefore a key institution. Later it became part of the Northampton Building Society and subsequently the Anglia Building Society. Now it is a small cog in the Nationwide group. The back yard, on the Radcliffe Street side was filled with a creosoted wooden structure called The Marler Hall. This was a meeting hall for the Wolverton Conservative Party who also, for a time, maintained an office above the Building Society. I think the house at 46 was a private residence. 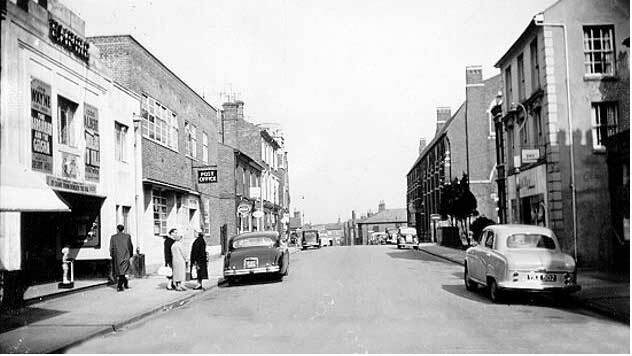 After the demolition of the “Little Streets” Church Street remained one of Wolverton’s oldest streets, but a decade or so later a good section of Church Street itself met the wrecker’s ball. The Agora, a covered shopping centre, took up a complete block of Church Street and Buckingham Street and closed off Radcliffe Street into the bargain. The section of Buckingham Street was almost entirely residential and the houses looked very much like those that remained. The only unique building to go wsa the Gas Board Showroom on the north west corner of Buckingham Street and Radcliffe Street. The south side of Church Street was not as fully developed commercially as the north side and was a mixture of residential and commercial. Those that had developed shop fronts had large plate glass windows with the exception of Antees, Eady, the butcher and King the baker. Starting from the back lane by the Science and Art Institute and the churchyard was the Sketchley Dye Works – so called but really a drop-off and collection point for laundry and dry cleaning. My father, in common with most other men of the period, wore detachable shirt collars. As far as I recall they were never washed at home with the rest of the laundry but were sent away for cleaning. They always came back stiff with starch. I assume Sketchley provided this service. This building was numbered 7. Number 9 may have been a residence, but at Number 11, for a time, was E A Read, a fishmonger. 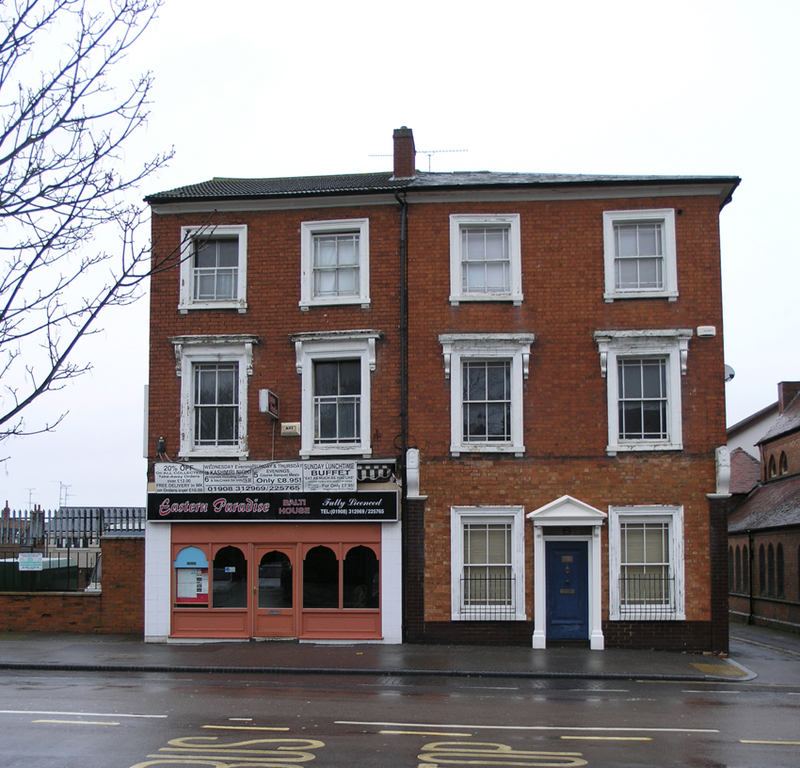 Tilley’s, one of Wolverton’s coal merchants, had their office at Number 13. Winter heating depended entirely on coal in those days and coal, coke and anthracite was delivered to household cellars or bunkers in blackened hessian hundredweight sacks. The Co-op occupied Number 15 but I am not sure in what capacity. At Number 17 the Northampton Chronicle and Echo maintained an office, presumably to pick up local news and sell photos and other services. The Co-op Mens Outfitters could be found at 19. Numbers 21,25, 29,31,37 were residential. 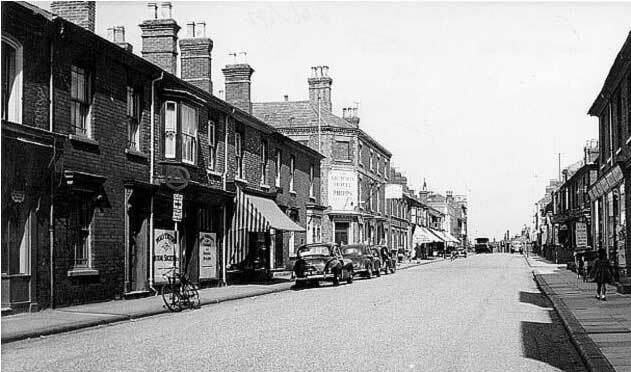 ET Ray, the Stony Stratford firm of solicitors, maintained a Wolverton office at Number 23. WG Sellick, who also had a garage at New Bradwell, had a service garage at Number 27. I think access must have been from the back alley. because all I remember of the shop window is that it was used to store tyres. 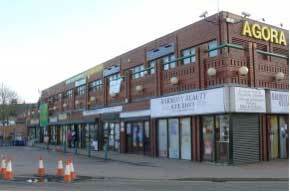 In later years, as people began to buy cars, Sellicks formed Wolverton Motors and had a purpose-built garage on the Stratford Road. Anstee’s. at Number 33, was a music shop. Here you could buy sheet music (still a business mainstay in the early 1950s, gramophone records, radios (they were still called wireless in the 50s) and record players. The mid-50s saw us begin to make the transition from the 78rpm disk to 45rpm EP (extended play) and 33rpm LP (Long Play). The two latter were manufactured using a vinyl compound which could bend and did not shatter easily. EPs were 7 inch diameter and used for pop singles. They had a punch-out centre for use in juke boxes. The other technology that came along with this was the diamond or sapphire stylus to replace the old steel needle. The LP catalogue in the mid-50s was mainly classical with some jazz and musical shows. The pop album had yet to be invented. Next door the Co=op had one of their two Butcher’s shops; the other was at the top of Jersey Road. 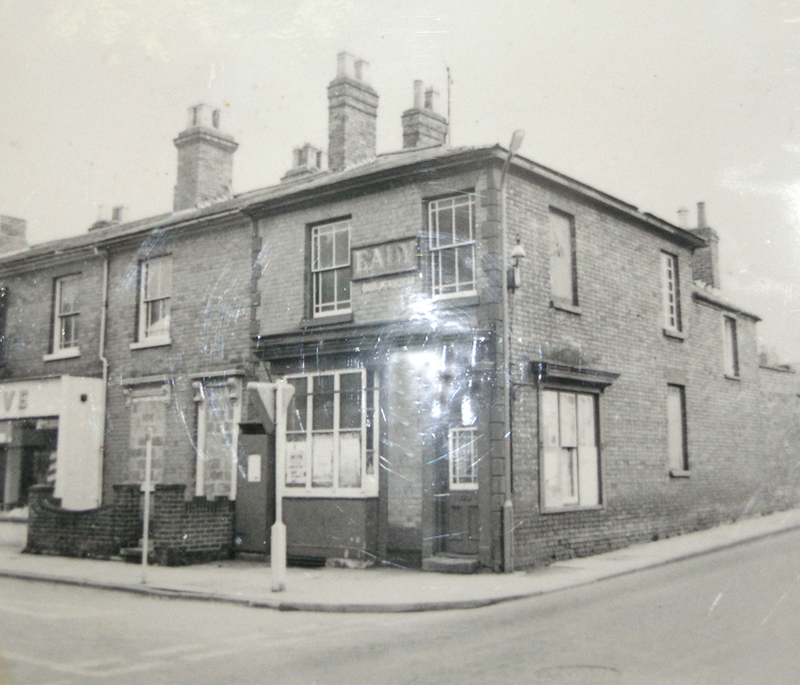 On the corner of Church Street and Radcliffe Street, at Number 39, was Eady the butcher. The entrance was at the corner angle. All of these shop had steps. At Number 41, on the opposite corner was a bakery, run by Mr and Mrs King with the help of their sons and one employee called Alf. Mrs King ran the shop and wrapped the loaves in a single sheet of white tissue for the customers who queued each morning for fresh bread. Mr King would deliver bread to customers in a pony and trap, usually in the afternoon. Baking started in the very early hours of the morning. 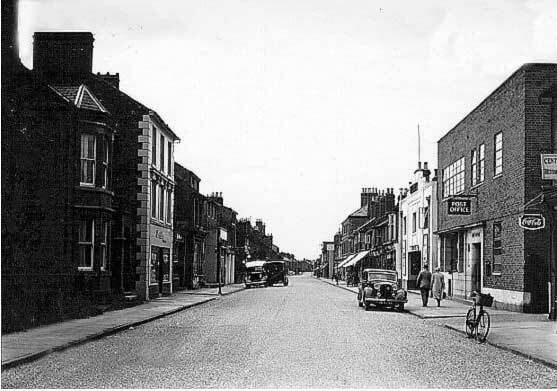 Further on from Kings were two more shops, Strickland’s – a wool shop, and a men’s barber, owned in the early 50s by Farndon and subsequently by Garwood. These were numbered 45 and 47.